In 2015, two new comic books shared a similar premise. It's the end of the world as we know it so governments aligned together and shipped off most of humanity off the planet and into space leaving behind the poor souls who didn't make the cut. One book created an exciting adventure for some of those remaining earthlings while the other fell creatively flat. 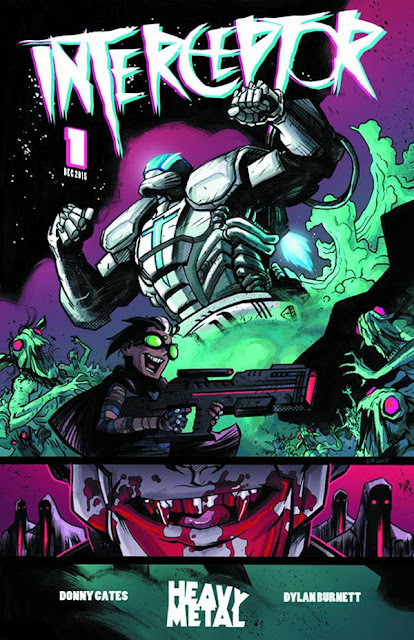 Luckily, the newest book to tackle this same premise, 'Interceptor' by Donny Cates and Dylan Burnett, has a few tricks up its sleeve combining genres and laying the groundwork for what could be a wild interplanetary sci-fi/horror ride. During the briefing of the newly elected president, 65-year-old President O'Connor who inexplicably looks 12, we discover through a very precise and intriguing exposition drop that there was more to the "grand exodus" than just escaping a polluted planet. In fact, humanity had not only poisoned their home planet but in doing so unwittingly released long dormant threats more deadly than climate change - vampires. It's an unexpected twist that raises the ante because the human race may have found a safe haven in another galaxy on planet Palus but not even detonating earth's supply of nuclear bombs could eradicate the scourge of blood-suckers. And now they've grown smarter with their sights on Palus. In a preventive move, the previous administration launched a program if the vampires ever became a viable threat again. They sent a highly trained female operative in a mech-suit to do reconnaissance back on earth to assess the danger. Cates has a knack for fast-paced storytelling that accelerates the action and raises the stakes. He's taken a familiar plot and mashed it up beyond the usual dour apocalyptic sci-fi tale. 'Interceptor' starts like a violin concerto and by the time we meet the super-operative Poli and the earthling Weep amid a barage of vampires on earth it's a full-blown heavy metal rock show. It wouldn't such a blast without the great expressive art of Dylan Burnett. The facial expressions of the staff during the briefing alone was fun but Burnett consistently displays a keen eye for spacing and layouts that allows the story to unfold quickly but without losing details where it matters the most. The alien designs are creepy and the color choices get increasingly darker as the story transitions back to the ravaged planet of earth. Burnett's style is fun, cartoonish at times with a slight anime influence that fits perfectly with Cates' script.